Dictionaries are always convenient. Its a necessary one always useful to have a dictionary at hand while travelling or accommodating to a new life. Technologies changed the world a lot. If you have a smartphone and an internet connection the world is on your palm. Sometimes you cant access to the internet so what if you have an offline dictionary app that sounds really good. Today we are listing best free offline dictionary apps for your Android device. One of the best and popular offline dictionaries available on the Android Play Store. The app allows you to browse dictionaries without a network connection when you are out of cellular tower range. You need to download the dictionaries you want to the SD card the first time you launch the app and then perform simple or advance searches. On Offline Dictionaries app there are more than 50 multi-lingual dictionaries to choose from, including English, French, German, Spanish, Arabic etc. One of the most downloaded Dictionary app in Android store and known as excellent smart app according to customer reviews. No internet connection is required to view the definitions or thesaurus. One of the highlight of the app is it allows for voice search means users can easily look up a word without having to spell it. 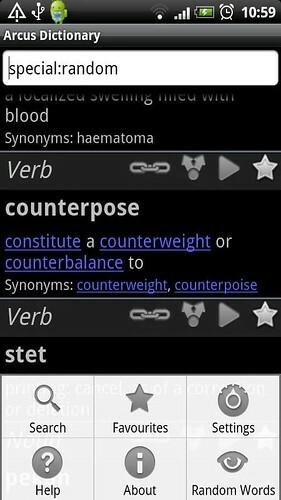 Most downloaded Android Dictionary app since 2010 with a huge data base of 2,000,000 definitions and synonyms. Its a powerful app and will prompt users to download all the necessary offline files to advantage of it without internet connection. 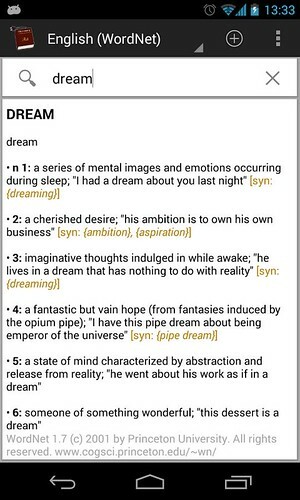 Another popular free Dictionary app with 165000+ words, definitions and synonyms. 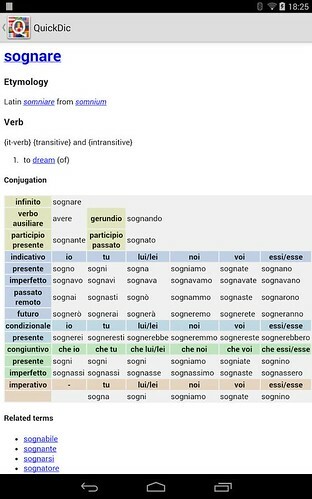 The Dictionary supports pronunciations for definitions, a favourites feature, word hyperlinking, sharing and customisation options. The app is light weight with just 6.2 MB. 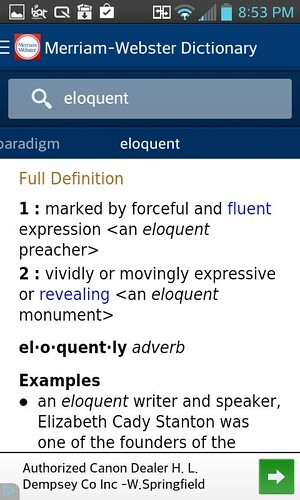 QuickDic is another popular offline dictionary available on Play Store. The app suits all devices running on Android 2.3.3 or any newer version. QuickDic have a huge database includes mono-lingual dictionaries in German, English, Italian and Korean. The app is also light weight with just 9.1 MB.